I have a thing for typewriters. I love the way they clack and ding. The way the paper tangibly fills up right before my eyes. I scour the shelves of second hand stores for them. I let my daughters pound their keys on lazy weekend afternoons. Typewriters are awesome. I recently watched Woody Allen: A Documentary, which was such a fascinating survey of his life and work. He introduced his own typewriter–a beauty he’s owned over 40 years–with which he has written and continues to write out all his screenplays. 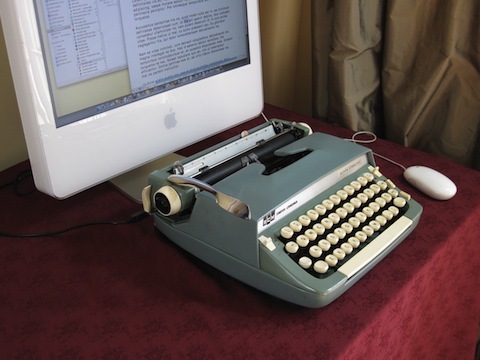 The other day, a radio news story made mention of the beautiful nostalgic hybrid manufacturers USB Typewriters. Seriously. Hook my typewriter up to my computer screen?!? How is this not the most brilliant idea ever? But to tide me over until my husband surprises me with one for Christmas, I went ahead and downloaded an awesome vintage typewriting font. Second-place awesome. And free.